We have dozens of trains and love playing with them and learning about them. For this reason, we are super excited that our January Virtual Book Club book is The Little Engine That Could by Watty Piper. We made a cool train themed treat last week to go along with the book. 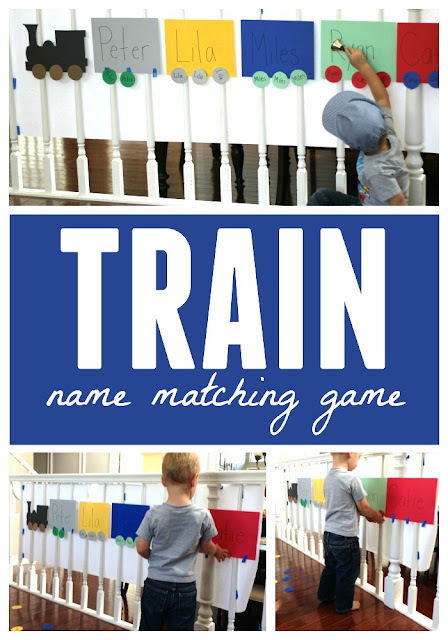 This week we are sharing our train name matching game that we created! I did this activity with my little preschool class but you can do it with a large group or a small group or individual child. You can use familiar names or family names or just use your child's name! To get set up I wrote each name on a different piece of paper (train car). Then I also traced and cut out an engine from black cardstock using an outline I found online. Lastly, I used a circle punch to cut out three wheels for each train car and wrote the kid's names on the train wheels. I put all of the wheels on the floor in front of the large train. Then I added painter's tape to the bottom of the train cars so that the kids knew where to attach the wheels. The kids hunted for their own names and matched them to the correct train car! Once our little preschool friends went home my son had fun just playing the game by himself with all of the other names. We talked about the letters we saw and what letter each name started with. 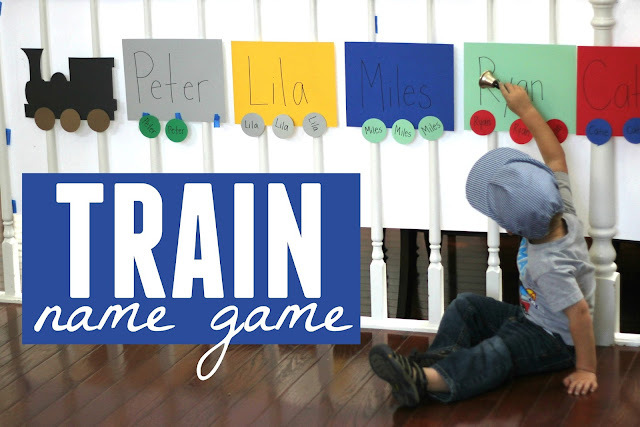 After we played the train name game we read The Little Engine That Could by Watty Piper. If you have a train lover, make sure to check out all of these other awesome train activities from our Virtual Book Club for Kids co-hosts this month!